The Saffrons: sometimes a simple name is sufficient to prompt a confection of histories. It is over a century since the orange-yellow crocus noted for its dyeing and medicinal qualities was grown in the fields where Eastbourne's cricketers spend their summers. Yet the gentle beauty of the noun lingers and has now been coupled to a children's nursery, an apartment block and a hotel. "I'm watching cricket at Eastbourne on Sunday," I tell friends. "Oh, you're going to the Saffrons," they reply. 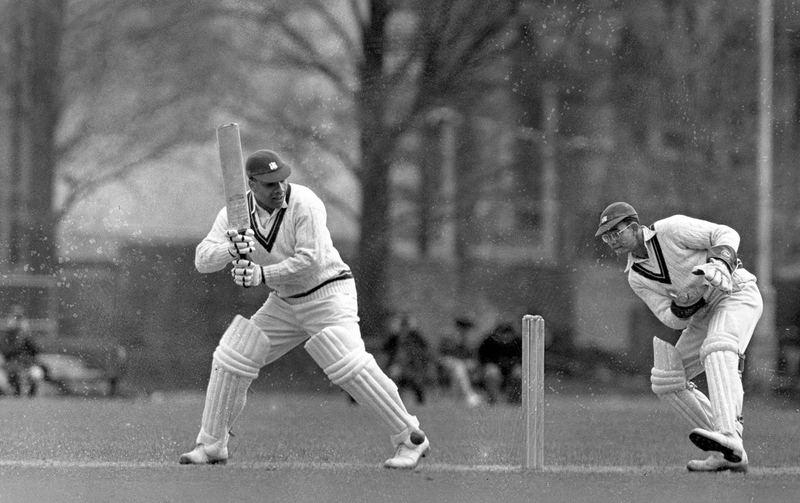 In Eastbourne's long 20th-century heyday there was a cricket week: two three-day county games and, as often as not, matches against the universities or the tourists. This was the ground on which AC MacLaren's personally selected amateur XI defeated Warwick Armstrong's seemingly invincible Australians in 1921, thereby giving Neville Cardus the only scoop of his career. There were important matches being played at The Oval and Leyton at the same time and Cardus' editor felt he should have been covering those. That opinion was strengthened when MacLaren's side was bowled out for 43 on the first day. By the second morning Cardus had sent his luggage to the railway station and was ready to leave; but he stayed instead and watched Aubrey Faulkner make 153. The Australians lost by 28 runs. 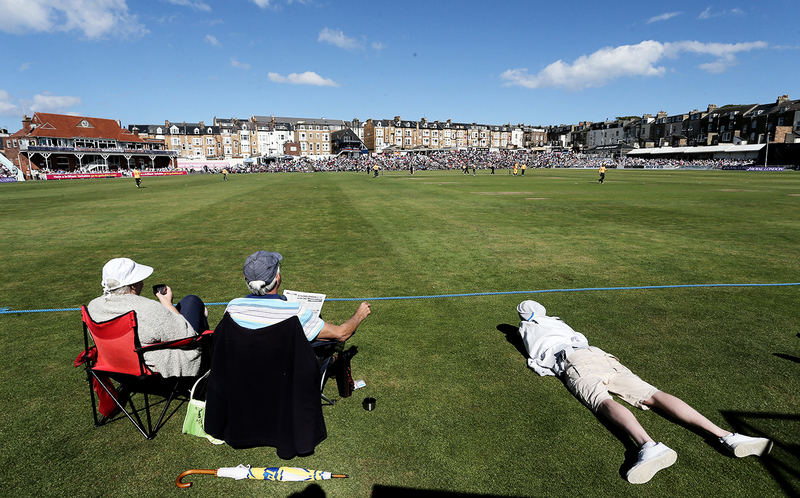 "At Eastbourne cricket is played to a background of croquet and bowls, old Colonels and straight-backed memsahibs going about their daily ritual, indifferent to the pock of bat on ball and the marauding seagulls," wrote Alan Ross, for whom India and Sussex were twin lodestars and who found his loves united in the batting of Duleepsinhji in the summer of 1932. And one scarcely has to look to see deeper histories and other aristocracies at Eastbourne. Behind the trees at the Larkin's Field End is the Compton Croquet Club, one of many references in the environs to the estate that owns acres of prime land in the town. The land on which cricket, hockey and soccer are played is still owned by the Duke of Devonshire. Seniors at the club pass on the stories they were told of horse-drawn carriages that set off from the Duke's Compton estate and travelled down the tree-lined Old Orchard Road into town. When I first visited the ground in September 2015 almost the only noise one could hear in the late afternoon was the gentle cracks of mallets on croquet balls. The players were dressed in communion white and moved slowly around the lawns in the soft sunlight of early autumn. The light for which Eastbourne is famed was in evidence when I returned to the Saffrons this May. It was present in the dazzling white of the bucket seats, the flounce of the marquees and the covers protecting the pitch to be used for the next day's game. Even the pages of my notebook dazzled. It was the light that gave Eric Ravilious both a theme and a context for many of his paintings. "Everything is dazzled or is bleached out," writes Anne Wroe of Eastbourne in her wonderful Six Facets of Light. "A man walking a dog across the lawns becomes a radiant ghost of himself. Teapot, cups and spoons blink blindingly on a table." Or there is David Hare in his play, The Moderate Soprano: "In Sussex, always a feeling of air and light, of the soft Downs beyond." 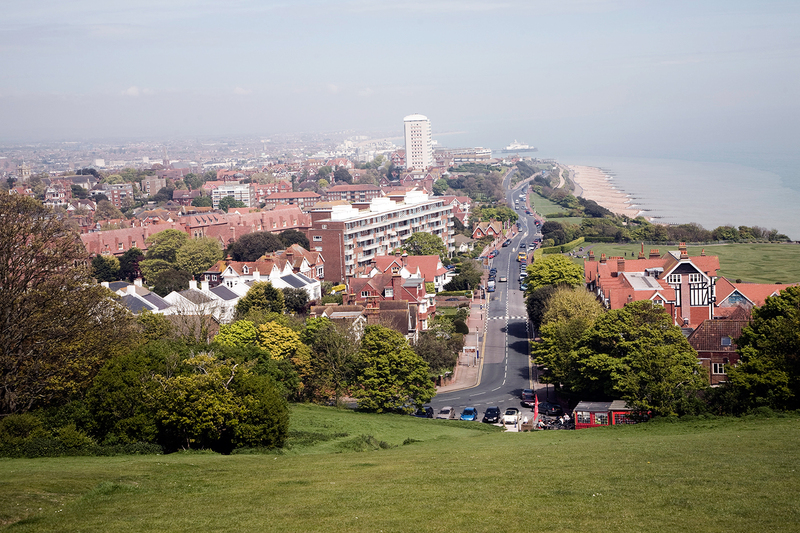 Eastbourne is an outground. First-class counties visit such venues because they wish to spread their cricket more widely or because their main ground is being used for a Test match or a pop concert. 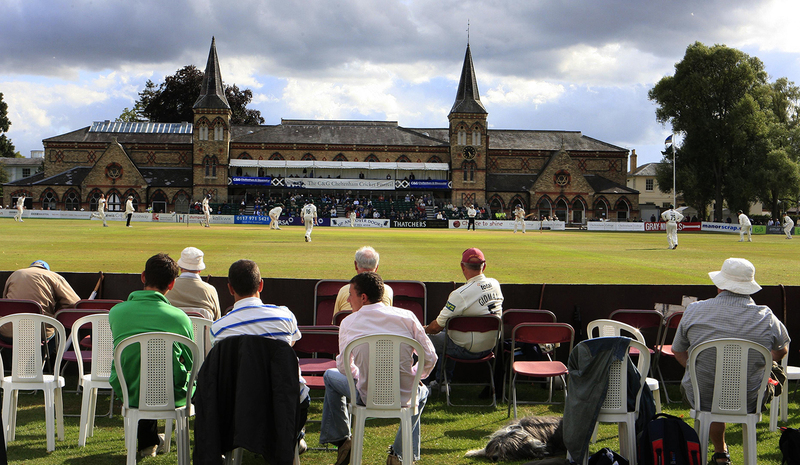 There is no obligation upon officials to use outgrounds, yet Gloucestershire supporters treasure their visits to Cheltenham College and Yorkshire members voted in favour of playing two four-day games at Scarborough. The heart of a county's cricket often beats miles away from its headquarters. I arrived in Eastbourne on the day before the 50-over game against Gloucestershire. At the ground a gaggle of officials was gazing at the pitch with the sort of attention biblical scholars might devote to a Coptic text. Both in the pavilion and beyond the boundary, club members scurried from task to task: busy, bothered, anxious, competent. County cricket was returning to the Saffrons for the first time in 17 years. On hundreds of deckchairs was the slogan "Eastbourne: Breathe It In", accompanied by silhouettes of yachts and gulls on yet another white background. The ground has lost many of the trees it possessed when a famous photograph was taken from the Town Hall in 1929, but beeches and elms still tossed and threshed in the breeze. In the pavilion the club's chairman, Ian Fletcher-Price, executive and articulate, talked of his pride in bringing county cricket back to the Saffrons after the bad times around the turn of the century when the pitch was not good enough, the club's committee was weak and Sussex were right to leave. He did not want Eastbourne to stretch itself too far by taking on a four-day game. On Larkin's Field, the ground at the back of the pavilion, Eastbourne's second team were taking on Crawley Eagles and a young spinner was having trouble finding his length as the end of the innings approached. "Keep at it, Henry" encouraged a team-mate as another ball disappeared into the trees bordering Saffrons Road. "Poor Henry's full tosses were hit for huge sixers." I had been in Eastbourne about two hours and I was speaking in Betjeman pastiche. Eastbourne is fortunate. Insofar as a clear trend can be discerned, it is that counties are moving away from outgrounds. Treasurers cite the cost of taking a game away from an HQ and seem oblivious to the less tangible benefits. Yet Glamorgan still play four-day games at Colwyn Bay and Swansea while Kent visit Beckenham and Tunbridge Wells for Championship matches. Some venues, Uxbridge and Richmond for example, are used for T20 games but most counties prefer to play such matches at their main grounds, where the potential income is greater. For some grounds, it is already too late. The Central Recreation Ground at Hastings is now the site of the Priory Meadow Shopping Centre; the name of the new development is in exquisite contrast to the ugliness of the shops. The only physical reminder that it was once one of Sussex's most precious venues is a sculpture of a batsman playing a hook. We are left with the recollections of others or the photographs: Lord Hawke signing an autograph, Denis Compton, his bat aloft and his hair tousled after he had beaten Jack Hobbs' record of 16 centuries in a season. Dover has also gone. The last first-class game played on the Crabble Athletic Ground took place in 1976 and club cricket ceased there in 2003. The famous pavilion and the remnants of the tiered seating now look out on rugby pitches. Those wanting to know what it was like to watch cricket at the Crabble are left with Cardus' rhapsodies on Lancashire's visits. Just as powerfully, perhaps, there is a photograph of Colin Cowdrey going out to bat for Kent in the 1960s. Behind him sit the members, perhaps thinking they have summers and summers of this lovely stuff ahead of them. Here at Eastbourne, Ian Fletcher-Price need not have worried. The weather was glorious and the corporate hospitality marquees at the Meads Road End clinked and hummed from mid-morning until deep in the evening. Early on, a great woollen shark wandered in front of the press tent. Later in the Sussex innings a wicket fell, and glancing up from a photograph of the blazered Sussex team in 1927, I saw the home side's Laurie Evans ambling across to check something with the analyst after being dismissed for 48. Sweat-stained, spiky-haired and carrying a water bottle, he could have been mistaken for a professional cyclist. So often we are told we must pay attention to the "here and now"; yet how frequently we are tugged back to the here and then; to Cardus, MacLaren and Duleep; to the gods we worship silently; to the Saffrons in its pomp. Sussex did not score enough runs and dropped too many catches. A target of 241 on a small ground like Eastbourne was never likely to test Gloucestershire's batting and the visitors won with eight balls to spare. The next day's press reports made much of Sussex's failure to accelerate in their later overs. A crowd of 3000 was mentioned, although there seemed to be more folk watching mid-afternoon. The complimentary lines about cricket returning to Eastbourne would have pleased the club's workers as they came to terms with sudden exhaustion. My train for London did not leave for an hour. Or maybe I just took a later train. The players threw their huge cricket bags on their shoulders and made for home. There were last circuits of the ground. The marquees were still thronged with easy affluence. The battlefield of conviviality was strewn with empty bottles and creased napkins. Hugo Boss argued with Ralph Lauren; Abercrombie and Fitch made plans for the following week with Jack Wills. I turned back again for one last look, and then another. The croquet players were still on the lawn and the Saffrons relaxed in the crystal light of a May evening.